Q. I have been charged what seems like a large amount of penalties on taxes that I owe. Is there any way to avoid these penalties? A. You may be able to have the penalties abated. Whether it is the IRS, the California Franchise Tax Board, or some other state or city that has assessed the penalties, they will often accept your explanation of reasonable cause as justification to remove penalties that have been assessed. In most cases, a well-written letter with relevant supporting documentation showing a reasonable explanation of why tax returns were filed late or why taxes were paid late will help to mitigate penalties. Q. How long do I have to hold investments generally for long term capital gain treatment? A. What a difference a day makes! We've all heard that expression more often than we care to remember. But when it comes to selling appreciated-in-value capital assets such as stocks, the expression isn't a cliché. One less day of ownership can be the difference between having your gain taxed at your regular tax rate (which can be as high as 39.6%) instead of at the preferential 20% top tax rate that applies to long-term capital gain from most capital assets. The tax term involved is called the holding period, the minimum period of time you must hold a capital asset for gain to be favorably taxed as long-term capital gain. Here's an introduction to some of the more common holding period rules that apply to capital assets. It will help you avoid making a tax mistake that can't be undone once your trade is made. Keep in mind, however, that the tax payable on your gain is only one of the factors to take into account in deciding when to sell a capital asset. For example, if you expect a stock's value to decline substantially before the long-term holding period is met, you may very well be better off by selling that stock immediately and paying tax at the higher rate for short-term gains. General holding period rule. To yield "long term" capital gain, an asset must be held for more than one year, in other words, for at least a year and a day. The holding period begins on the day after you buy an asset, and ends on the day you sell it. For example, suppose you bought stock on Jan. 3 of Year 1. Your holding period began on Jan. 4 (the day after you bought). If you sell at a profit on or after Jan. 4 of Year 2, your gain will be long-term capital gain. If you sell on Jan. 3, Year 2 (or sooner), any gain will be short-term, taxed at the same rate as ordinary income. Keep in mind that for publicly traded securities, the holding period begins on the day after the trading date you bought the securities, and ends on the trading date you sold them. If you inherit a capital asset, you are automatically treated as having held it for more than one year. Thus, for example, if you inherit an asset and sell it six months later at a gain, your gain is taxed as long-term capital gain. This rule applies regardless of how long the decedent owned the asset. A dual holding period applies if you have been granted an incentive stock option (ISO) by your employer and you exercise the option and buy stock. To qualify for full long-term capital gain treatment on the stock you buy, you must hold the stock for (1) at least one year after the shares were transferred to you, and (2) at least two years from the date that the ISO was granted. Up to one-half of the gain on the sale of qualified small business stock (up to 60% if the stock is in an empowerment zone business) is tax free (with the balance generally taxed at a special 28% capital gains rate) if the stock was originally issued after Aug. 10, 1993 by a qualifying corporation, and the stock is held for more than five years. If you invest in commodity futures, gain on the sale of those futures qualifies as long-term capital gain as long as you held them for at least six months and a day before the sale. A capital gain dividend from a mutual fund automatically is treated as long-term capital gain, regardless of how long you held the mutual fund shares generating the dividend. Adding on someone else's holding period. There are instances where your holding period includes someone else's. For example, if someone gives you stock, your holding period includes the donor's holding period. Similarly, if you acquire property from your spouse (or your ex-spouse, in the case of a divorce), your holding period includes your spouse (or ex-spouse's) holding period. Adding on another property's holding period. Where you defer gain on property by exchanging it for other property, the holding period of the new property includes the holding period for the old property. Thus, for example, if you swap an apartment building for an office building, your holding period for the office building includes the period of time you held the apartment building. Dividends taxed at long-term capital gains rates. As you may be aware, dividends that you receive from domestic corporations and "qualified foreign corporations" are taxed at the 15% and 20% rates applicable to long-term capital gains. To qualify for such treatment, you must hold the stock on which the dividend is paid for more than 60 days during the 120-day period beginning 60 days before the ex-dividend date. In the case of dividends with respect to preferred stock which are attributable to a period or periods aggregating more than 366 days, you must hold the stock for more than 90 days during the 180-day period beginning 90 days before the ex-dividend date. Where holding period doesn't matter. In the case of assets held in an IRA or qualified retirement account, it doesn't matter how long the stocks, bonds, or other assets were held. That's because all your withdrawals will be treated as ordinary income. And if the assets are held within a Roth IRA, your withdrawals will be 100% tax-free if they are qualified distributions (made after you've had a Roth IRA for five tax years and paid out after you are 59-1/2, or if you are disabled, or for certain first-time homebuyer expenses, or after your death). Q. I am a sole proprietor, 33 years old, with no employees, and profit of about $125K. I am interested in making the maximum possible retirement plan contribution this year. Should I use a SEP IRA? A. You could use a SEP IRA. If you did, you could contribute about $23,400 based on your profit of $125K. However, you should consider the use of a Solo 401(k). 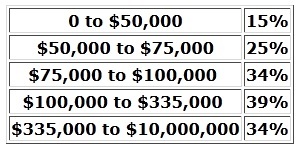 With a Solo 401(k) you could contribute $43,000 with that same profit of $125K. Q. We have not filed tax returns for several years and are now looking to get everything caught up. How do we go about getting the whole situation straightened out without the IRS demanding immediate payment for thousands of dollars? A. You can first have all of your returns prepared to see if you owe tax. If you determine that tax is due, you can request a monthly payment arrangement with the IRS. The amount of the monthly payment will depend on your income and living expenses. When you establish the payment arrangement, the IRS will normally mail you a payment reminder each month until the entire amount of tax is paid. Q. I am thinking of incorporating my company. What are some of the issues I need to consider? You should be aware that "Personal Service Corporations" are taxed at a flat rate of 35%. We can discuss the pros and cons of the various entity choices. Ultimately though, your specific fact set will help narrow the choices to either C Corp, or S Corp, or perhaps an LLC. Whether you use a law firm or an incorporation company like Parasec to help you form your entity, we still recommend that you own the following book from Mancuso. It includes many of the answers to the questions that will occur to you over time. ...Hope you have found this helpful! Check back again for more "frequently asked questions!" You can log in to view or update your tax information at any time. All of your account information is secured using 256-bit SSL encryption, and we can give you access to your tax forms online. Stay current with recent tax changes, news, and financial tips. We provide a newsletter monthly here on our site and via email so you can stay in touch with changing regulation throughout the year. Utilizing cutting edge technology, our mission is to be a premier provider of accounting, tax, auditing, and consulting services to our clients, while maintaining an uncompromised standard of ethics and commitment leading to innovative and value-added solutions to our clients, employees, and community. We are dedicated to the pursuit of professional excellence and these values dictate that we do so without compromise. .
We look forward to hearing from you. You can also send us a message directly through the contact page of this website. © 2019 Wubbels & Duffy All Rights Reserved.